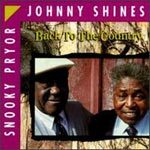 CD review: "Back to the Country"
This review first appeared in the January/February 1992 issue of Living Blues magazine. Over a half century since he first set out to make his way in the world through music, Johnny Shines is still performing. His most recent effort teams him again with Snooky Pryor in an all-acoustic setting. Age has taken its toll on Shines (he is 76) and his singing doesn't have the same verve and energy as it once did. Still, the rich nasal tone persists and his timing and sense of drama remain undiminished. Shines, whose considerable reputation has always rested on his guitar playing, does not play the instrument on this album. Pryor's harp playing is still spirited and, especially on his own songs, his is given plenty of space to stretch out. Despite Shines' and Pryor's game efforts, and some fine original compositions by both men, the album falls far short of what it could have been. Co-producer John Nicholas, who plays guitar on the album, is not content to sit in the background. Instead, his National Steel guitar is up front, sometimes almost drowning out the vocals and harp. At times the album seems more like a seance to bring back Shines' legendary half-brother Robert Johnson than an album by two of the greatest blues artists of all time. This feeling is heightened by the inclusion of four Johnson covers  "They're Red Hot," "Crossroads," "Come on in My Kitchen" and "Terraplane"  all performed as straight imitations. Shines' recordings of the 1950s and '60s were much more interesting because his reworkings of Johnson's material carried his own stamp. What is ultimately distressing about this album is that Shines is reduced to a curiosity rather than being presented as a living, creative and evolving artist. All of this, however, does not make this a bad album. When not performing the Johnson pieces, Shines, Pryor and Nicholas achieve a tightness not always found when two different generations play together. Shines' vocals and Pryor's harp still have their power and it is wonderful to hear these two legends of a long-past era.